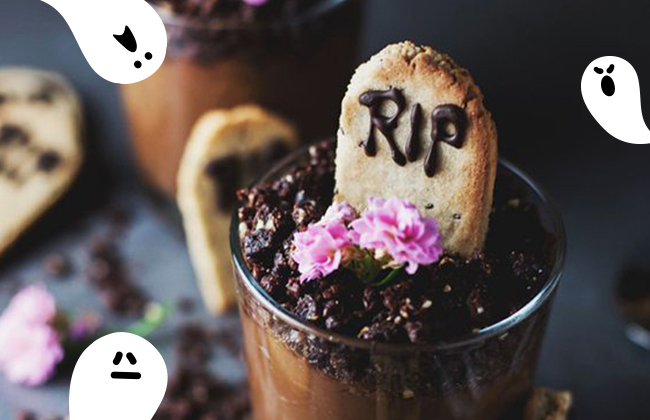 It's time to get your bake on, Halloween is almost upon us! 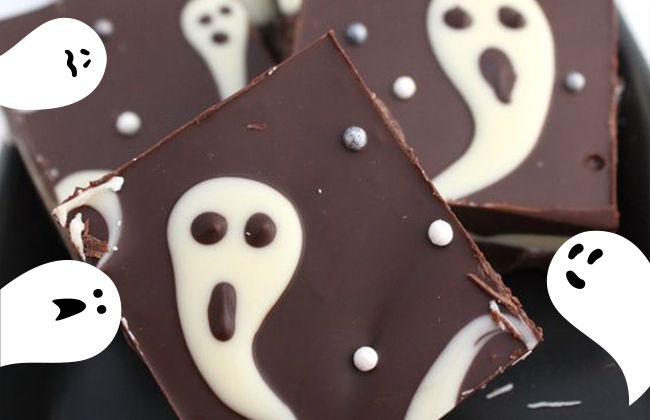 Check out these 7 amazing sweet treats that are just getting us so pumped for Fright Night. Roll on the fake blood, scary movies, and Trick or Treating - we need some candy! Geddit? Bloody good! Genius. 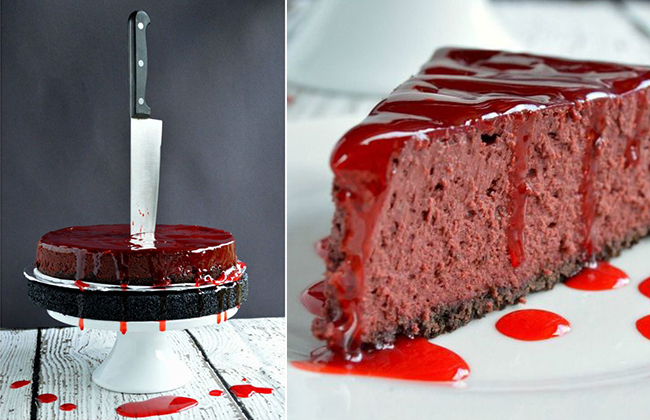 This incredible cheesecake is actually red velvet, and what's better than that? Crammed with chocolate but made super special with the homemade gel frosting that's creepily good! The secret to this is the presentation. Make sure that you have a foam base for it to sit on top of the foil cake base. This is so you can properly stab a knife into it and make it look super gory. 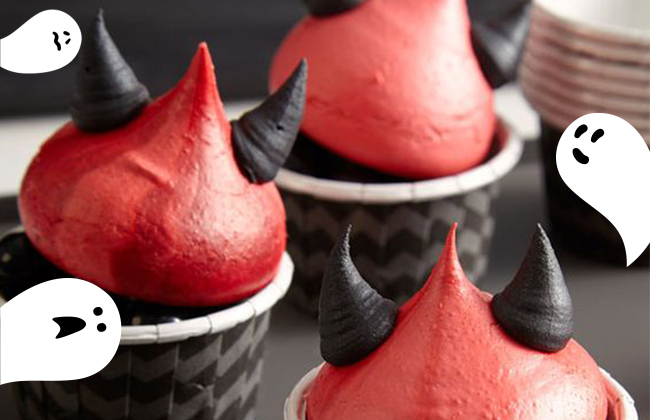 Devils aren't something that you see too much of in Halloween baking but these are so cool! All you need is some food coloring to add to your meringue mixes in order to make them the great Halloween shades of red and black. Top onto cookies or simple cupcakes in cases and you've got some cheeky little devils on your dinner table! If you want to create something tasty for a Halloween bash but you're not really the best in the kitchen then this is perfect. The only ingredients in this candy bark are 6 bars of dark chocolate and 3 bars of white chocolate with a few sprinkles for decoration. Simple melt half of the dark chocolate over a Bain Marie or in the microwave (be sure to sure at 10-second intervals!) and then spread it over a plastic-wrapped 8" x 8' baking tin. You can add some cookie or candy pieces in here if you want! Refrigerate until it's hard and then melt two of the white chocolate bars and do the same, melt and then refrigerate until hard. Finally, melt the final three dark chocolate bars and do the same thing. Melt the final white chocolate bar and then add into a piping bag. Pipe your ghosts and then add sprinkles before refrigerating again! Another meringue dish that looks incredibly impressive but it's actually pretty easy to do! These spooky swirled meringues. 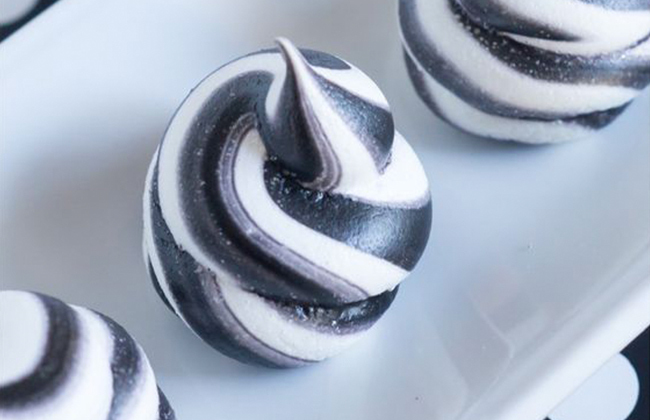 To create them all you have to do is whip up a meringue mix, grab yourself a piping bag and paint a few stripes in the middle of it using black gel paste food coloring. Simply fill the piping bag with meringue and you're good to go! 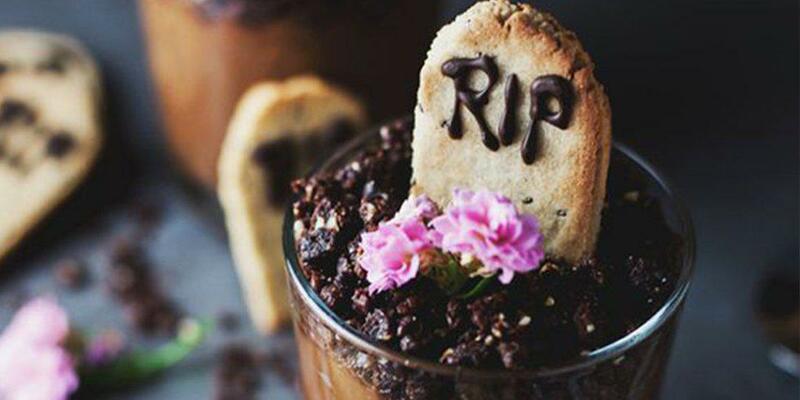 These mousse pots are actually raw and vegan, would you believe it? All you need for the mousse is 2 avocados, 8 tbsp of cocoa powder, 8 tbsp of maple syrup and 120ml dairy-free milk. Blitz up in the blender and you're done! The crumbly topping on these are actually British Nakd bars which are just bars made from only nuts and fruit, find a US alternative or simply crush up Oreos to create a soil. The tombstone cookies really make these pots pop, this is the non-raw bit! But, all you need is ground almonds, arrowroot powder, coconut oil, maple syrup or agave nectar and vanilla extract for your dough. These can be used as cocktail stirrers or simply seriously juicy candy treats! 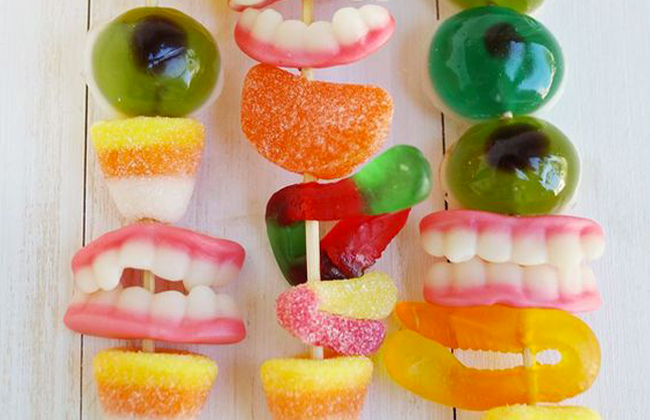 These are the simplest from the bunch, you only need a selection of candy and some long skewers. Make sure you have eyes, teeth and most important, candy corns! Color your cupcake batter with a little pink food coloring and mix a 1/3 cup fresh chopped strawberries and 3 tbsp strawberry preserve into it. You can find the full recipe here. Create a vanilla buttercream for the top and color it bright green! 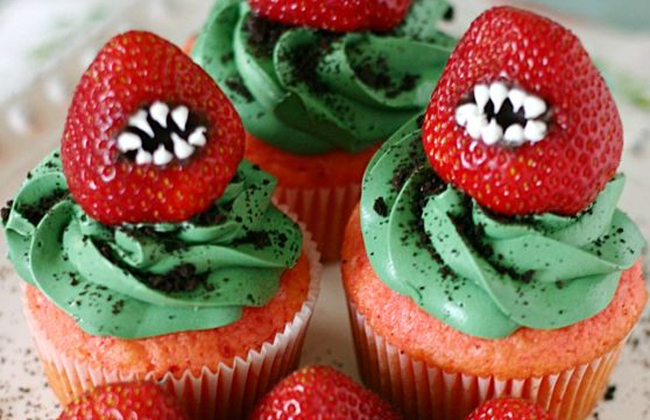 Sprinkle with crushed Oreos to look like dirt and decorate whole strawberries with writing icing to give them teeth!